Home Collocations Regret Definition. What does regret mean? We often hear people talking about their regrets. They blame themselves for doing bad things or for not doing anything when they could have done something. No one wants to live with regrets, but it seems unavoidable for most people. People regret about their past decisions or actions. They are unhappy or disappointed with their present lives and they dwell in the past blaming themselves for their or other people’s misfortunes. 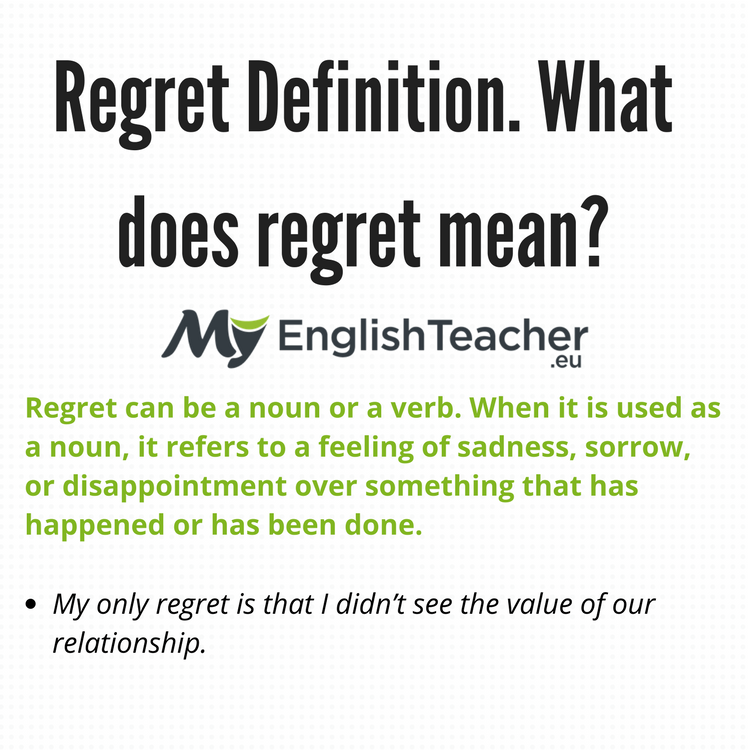 In this article, we will talk about the meanings of regret, its synonyms as well as related idioms, phrasal verbs and collocations. My only regret is that I didn’t see the value of our relationship. She forgave him when she saw regrets in his eyes. When regret is a verb, it means to feel sad, sorry or unhappy about something you did or were unable to do. Regret is a transitive verb and it needs an object, obviously the thing that one is sad about. I want to say that I regret leaving you. I don’t want to do something I might regret later. Paul: Hey, Paul. It’s good to see you again. 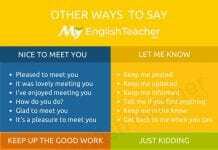 How have you been? David: I’m good. I am planning to settle down here. I am not going back to LA. Paul: Wow! That’s good to hear. So, Silvia is here too? David: No, we just had a divorce. She got our house and I am renting an apartment here. I just got a job. Paul: I’m sorry to hear that. David: Don’t be sorry. I think it was for the better. We can’t live together. We are completely different from each other. I regret marrying her. Paul: Well, I am getting married next month. I was thinking of inviting you and Silvia. I guess it’s just you now. David: I’m happy for you. Paul: I hope we stay happy together and we don’t regret this. David: It’s great to be married to the right person. To be honest, I didn’t regret marrying Silvia. I regret not making her feel happy in our marriage. Paul: Oh, man. I feel sad about your divorce. It must be hard. David: Yeah, I guess a drink can make it better. Paul: Yeah, I think so too. We can have a drink now. 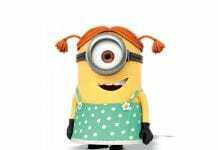 I am free until 10 p.m..
Be sorry about – this is commonly used to show sympathy. When we are sorry about someone or something, it means that we are sad that something bad has happened. Feel grief at – when someone feels grief at something, it means that they feel great sadness. She felt great grief at the sudden death of her father. They don’t want anyone to weep over their misfortune. Feel sad about – this is used to say that something is making you feel unhappy. I feel sad about the bad news. Feel sorry for – to feel sympathy for someone because they are in difficult or unpleasant situation. She felt sorry for her mother who had to work really hard to support their family. Feel remorse about – to feel great regret or guilt about the mistake that you committed. He felt remorse about abandoning her and their kids. Cry over – to weep because of someone or something. She is still crying over her failed marriage. Repent of – when someone repents of something, it means that they feel great regret about their wrongdoing or sin. I have nothing to repent of because I believe I made great choices in my life. Nestor grieved over his friend’s misfortune. Brood over – to worry anxiously about something or someone. Jen has been brooding over her financial problems since she lost a lot of money in the casino. Complain about – to express dissatisfaction or annoyance about something. I don’t want to complain about my taxes, but they are too high. Condole with – to express sympathy with a person who is suffering sorrow, misfortune, or grief. I should condole with my friend because I know he needs my sympathy in this unfortunate time. Lament for – to mourn for a person’s loss or death. They gathered to lament for the death of their dear friend. Mourn for – to show deep sorrow or regret for someone or someone’s death. We all mourned for the victims of the disaster. Think better of – to decide that something is not a good idea. I wanted to buy an expensive smart phone, but I thought better of it when I received my credit card bills. To kick oneself: Someone who kicks themselves means they blame or criticize themselves for something that they have done. You have to stop kicking yourself. It wasn’t your fault that we lost the game. Better (to be) safe than sorry: This means that someone should be careful before doing something as they may do something that they may regret later. I need to study the proposal before I take any action. It’s better to be safe than sorry. Crying over spilt milk: When someone is crying over a spilt milk, it means that they are still sad about their past misfortune. You should focus on your life now. There’s no use crying over spilt milk. Pangs of conscience: This refers to a feeling of guilt, embarrassment, or shame, which is caused by behavior one regrets. I felt a pang of conscience when I didn’t do my best to meet the project’s deadline. Dissolve into tears: To suddenly cry. She dissolved into tears when she saw her ex-boyfriend happily dating a beautiful young girl. Have hard feelings: To have feelings of resentment or hatred. I didn’t know that my decision to sell our company left him with such hard feelings. Put on the weeps: To cry, breakdown, sob, or weep. She put on the weeps when he told her that he wanted a divorce. Ring the blues: To cry, breakdown, sob, or weep. She rang the blues when she was told that she was fired. Rue the day: To feel very sorry about an event. She will rue the day that she sold her house. She shed bitter tears when her expensive tote bag was stolen. Turn on waterworks: To cry too much that it looks like it is not sincere. They staff turned on waterworks when the CEO left the company. Sing the blues: To express grief or to complain in order to gain sympathy from other people. Many people are singing the blues over the government. Take it hard: To be depressed or upset with something. I’m still upset with what happened to my project. Maybe I took it too hard. Cry a river: To cry very hard in the presence of another person to gain their sympathy. Joan cried a river when her mother told her that she didn’t like her to get married soon. Cry your eyes out: To weep bitterly for a long time. She cried her eyes out when her IPhone 8 was lost. Eat one’s heart out: To grieve in silence. She has been eating her heart out since her boyfriend went missing. Stab of conscience: When someone feels a stab of conscience, it means that they feel responsible for something bad that happened. She felt a stab of conscience when she realized that he got into an accident because of her. Wear the willow: To grieve as the willow tree is traditionally associated with sadness. She wore the willow when she heard the news that her best friend and her ex-boyfriend are getting married.